A doctor who would play sport ‘at any opportunity’ suddenly collapsed due to cardiomyopathy. 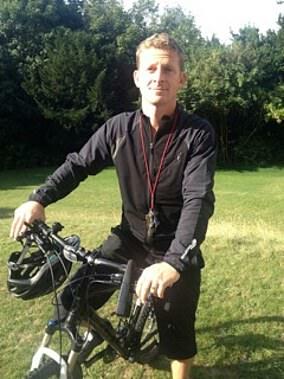 Chris Marshall, 44, from West Sussex, would cycle more than 20 miles a day, to and from his job as a consultant anesthetist at Worthing Hospital. However, in May 2016, the father-of-two collapsed while taking out the recycling, breaking five ribs and rupturing a disc. Doctors only discovered Mr Marshall’s heart condition while he was being prepared for emergency back surgery. He then had a pacemaker fitted a year later. After the fall, Mr Marshall was rushed to surgery when he lost all feeling in his left foot. He was then given an ECG while waiting for the operation. ‘I remember saying to the doctors, “I don’t understand why you are doing an ECG on me, I’m fit and healthy,” he said. The ECG revealed a problem in Mr Marshall’s left ventricle – one of the muscular chambers that pumps oxygen-rich blood around the body. He was later diagnosed with cardiomyopathy, which had caused left bundle branch block – indicates the heart’s electrical impulse is not being distributed across the organ in the normal way. ‘On reflection, I’d had some fairly significant symptoms over the past few years, including “heart rate dangerously high” whenever I measured it on the running machine and cramp in my neck muscles whenever I sprinted,’ Mr Marshall said. ‘I’d get extreme shortness of breath and found cycling harder and harder; falling asleep straightaway as soon I got home from the hospital. ‘I put it down to working too hard or needing to get fitter, so I went to the gym regularly, even though I’d get out of breath and drenched in sweat in no time. Mr Marshall is joining a campaign by Cardiomyopathy UK to show heart conditions are not always the result of an unhealthy lifestyle. ‘As a doctor, I’ve seen lots of people with heart disease. Most are much older than me; many have smoked, had a poor diet and not exercised – but by no means all,’ he said. And despite often being extremely tired, Mr Marshall still ‘looks’ healthy, with many not understanding his near-constant fatigue, which has forced him to cut back on his hours.